The Panoramic Room is a radiantly beautiful open-plan space, featuring a private sundeck that simply begs for company. 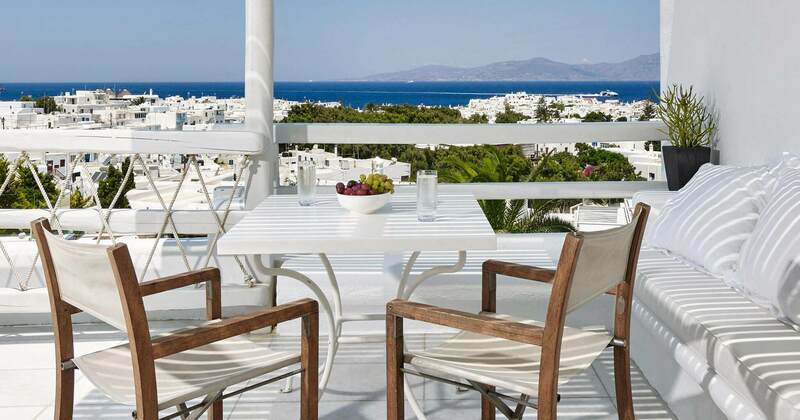 The marble, plaster and wooden features will infuse your Mykonos stay with a new appreciation for mediterranean luxury where quality always comes first. Located on the first floor, the Panoramic Room is the most photogenic accommodation in the entire hotel. Steadily favoured by artists and designers the world over, it combines an effortlessly cosmopolitan ambience with true versatility. The private 12m² sundeck features both sunbeds and a shaded area that makes for the perfect breakfast nook. Choose your fellow sunbathers wisely – they might never want to leave! After the sun goes down, use your full service bar cart to mix pre-dinner cocktails, before heading downstairs for some fine dining. Or don’t, as the cart easily converts into a dining table, seamlessly transitioning from relaxation to recreation. Staying in has never been so enticing!